BAM Jam is just 3 weeks away. For teams that want to go deep in to their brackets, being in shape, both from a stamina and strength perspective, will prove to be very beneficial. Adding in high intensity ball handling is a great way to build your strength, endurance and skills. 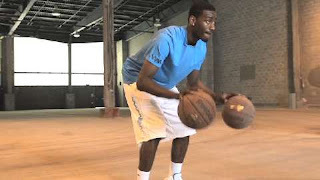 Here is a simple 3 week workout program that you can do from your home and doesn't require any special equipment other then a pair of shoes and a basketball and the willingness to contribute 2-3 30 minute sessions per week. *Here's your medical warning: do not try any of this before consulting your doctor to make sure you are in good enough physical condition to try this. While the plan is simple, its success comes down to how hard you are willing to work at it. The results you see directly relate to the effort you put in. Tabata training was discovered by Japanese scientist Dr. Izumi Tabata and a team of researchers from the National Institute of Fitness and Sports in Tokyo. Basically, it is a form of High Intensity Interval Training. It is 8 rounds of a given exercise where you go as hard as you can for 20 seconds and then rest 10 seconds (a total of 4 minutes). It has been shown to improve both your aerobic and anaerobic systems in less time then traditional longer 1-hour medium intensity workouts. The exercises can be anything from sit ups, push ups, squats, burpees or even high intensity ball handing drills like stationary two ball dribbling. Want a more intense Tabata workout (you did check with your doctor first, right)? String 4 of these Tabata sessions together with different exercises for 16 minutes of work. There is really no reason a basketball player needs to train to run long distances. Most studies will show you that players that play the most minutes in a game only run 3-5 miles. For BAM Jam in a half court setting that number is even less. But, quick bursts and short distances are required. So is the ability to set a strong screen, roll laterally, fight through a screen and grab a rebound over someone else. To be ready for anything, mix in different strength and conditioning exercises to single workout. This is a workout that can also interchange the exercises. Try using burpees in place of push ups, wall walks in place of the handstand hold and air squats in place of the lounges. Alternate The Tabata and The Mix It Up for each day you are doing them. If you are doing 2 sessions per week, you will do a total of 6 sessions. If you are doing 3 sessions per week, you will do a total of 9 sessions. If at any point you feel faint, sick or just uncommonly bad for this type of workout, stop! Before you start each session, make sure you thoroughly warm up each body part you are about to use. When you are done with your sessions, make sure you cool yourself down. Let your heart rate come back to normal, do some easy stretching and be sure you hydrate. *Medical warning: do not try any of these exercises unless your doctor has cleared you for vigorous and intense physical activity.